Complete cast swing fitting complete with bearing to fit to a 115mm (4 1/2") or 125mm (5") Diameter steel swing beam. Chains connect directly into this fitting with the use of a small shackle. This is a galvanized ductile iron swing hanger with a shackle pendulum, opening 1/2" wide. These hangers are pressed in two halves. The lower half of the swing hanger body has a shackle pendulum with a oilite bronze bearing incorporated into it to reduce wear. These bearings do not need to be oiled as the bronze is impregnated with lubrication. 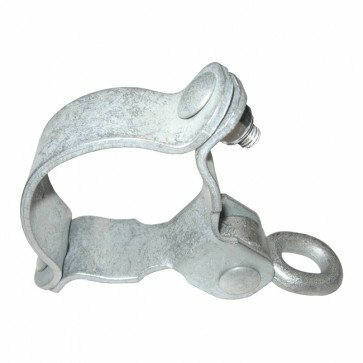 Suitable for all types of chains which are usually connected by a small quick repair link or stainless steel shackle.